By making use of this analogy between the odd-order and even-order Supercubes, we can apply the solution method of odd-order Supercubes to even-order Supercubes. But since even-order Supercubes have their own peculiarities, there will be some complications in the solution method. In what follows, I will focus on those aspects where the solution method of even-order Supercubes differs from that of odd-order Supercubes. Therefore, some parts of the following description of solution method will be quite brief, especially those aspects that are basically the same as solving odd-order Supercubes. If necessary, please refer to TUTORIAL ON SUPERCUBE SOLVING (2) (Solving Odd-Order Supercubes) for detailed description of each step. This step is basically the same as Step I for solving odd-order Supercubes. The only difference in doing this step for even-order Supercubes is that since even-order Supercubes have no core center pieces, you can freely choose any face to be the blue face say. But after you make this first choice, the colors of the remaining faces are then determined. Like Step III for solving odd-order Supercubes, this step is also sub-divided into three sub-steps. Thanks to Fact 1, there is no need to do this step for 4th-order Supercubes. When doing this sub-step for the 7th-order Supercube above, since the "A.00" core center piece has rotated by 90° clockwise, when you write out the alphabet list for each orbit of non-core center pieces, you should start from the bottom right hand corner of the red face (assuming that the red face is the 6th face). Thus, the alphabet lists of the "04" and "11" orbits are, respectively, "ADCB" and "CBAD", which have odd relative parities; whereas the alphabet list of the "10" orbit is "ABCD", which has even relative parity (note that you need not write out the alphabet lists of the "05" and "07" orbits because these two are orbits of point pieces, which must have even relative parities according to Fact 1. Neither do you need to write out the alphabet list of the "08" orbit because this orbit is matched up with the "04" orbit and so it must have the same relative parity as that of the "04" orbit, according to Fact 2). When you try to do the same for the 6th-order Supercube above, you immediately encounter a problem. Since there is no core center piece in this Supercube, from which corner should you start when you write out the alphabet lists? In this case, the alphabet lists of the "05" and "07" orbits will give you useful hints. Note that Facts 1 and 2 given above are also applicable to even-order Supercubes. Now if you start from the top right hand corner of the red face, you will find that the alphabet lists of the "05" and "07" orbits are, respectively, "BCDA" and "DABC", which have odd relative parities, in violation of Fact 1. In fact, you can verify that if you start from the bottom left hand corner, you will also obtain odd relative parities. But if you start from the bottom right hand corner or top left hand corner, you will obtain even relative parities. Thus, the correct way to write out the alphabet lists is to start from the bottom right hand corner or top left hand corner of the red face. Now if you start from the bottom right hand corner, you will find that the alphabet lists of the "04" orbit is "ADCB", which has odd relative parity (by Fact 2, you may deduce that the "08" orbit also has odd relative parity). In summary, when doing Sub-step 1 for an even-order Supercube, you should first identify a corner on the red face such that when you start writing the alphabet lists of the orbits of point pieces from that corner, you will obtain even relative parities. You then write out the alphabet lists of the paired pieces (note that even-order Supercubes have no cross pieces) and check whether all these alphabet lists have even relative parities. If so, then you may jump to Sub-step 3. If not, then you need to go through Sub-step 2. The subscripted variable x represents the non-core inner layer that you need to apply this formula to. Please note that by just focusing on the focused piece orbits as described above, you will autmoatically take care of all non-core center piece orbits, i.e. you will ensure that all non-core center piece orbits have even relative parities. 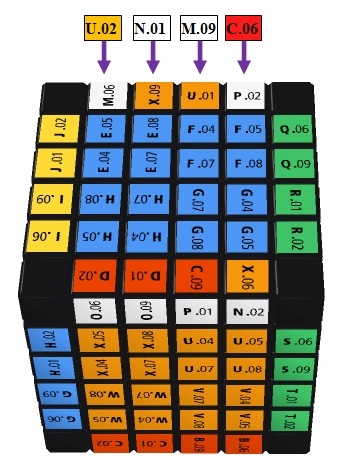 Using the 6th-order Supercube shown above as an example, you may recall that the "08" orbit has odd relative parity while the "07" orbit has even relative parity. This means that the first inner layer in the right half of the red face contains a focused piece orbit with odd relative parity. So you need to apply formula (3) to this inner layer, i.e. apply (3) once with the variable x substituted by 1. (Note that the leftmost center piece among the focused pieces, e.g. the "D.07" piece in the above example, is necessarily a point piece. By Fact 1 above, its orbit must have even relative parity and so need not be considered. For this reason, you can always exclude the leftmost center piece among the focused pieces from consideration.) After the above operation, all orbits of non-core center pieces in this Supercube will have even relative parities. This sub-step is no different from Sub-step 3 for solving odd-order Supercubes in that you need to use the (XYZ) Formulas (i.e. formulas (1) and (2) given above) and Table 1 below to restore the alphabet list of each non-core center piece orbit to "ABCD". This step is no different from Step IV for solving odd-order Supercubes. No additional explanation is needed. Note that you do not need to use the "Core Edge Flipping Formula" in this step because even-order Supercubes do not have core edge pieces. For this reason, this formula is not given here. To match the edge pieces on the front-top and back-top edges of the Supercube shown above, you may first substitute 1 into the variable x and use formula (5). This will flip and swap the "G.06-X.02" and "A.02-E.06" edge pieces. You then substitute 1 into the variable x and use formula (3). This will swap the "D.06-F.02" and "G.06-X.02" edge pieces and thus yield the desired result. Note that by using formulas (3) and (5) one after the other on the same non-core inner layer, the net effect is that the top center (as well as other centers) will not get screwed up (try and see). To match the edge pieces on the front-top and back-top edges of the Supercube shown above, you may first substitute 1 into the variable x and use formula (3). This will swap the "C.06-P.02" and "N.02-X.06" edge pieces. 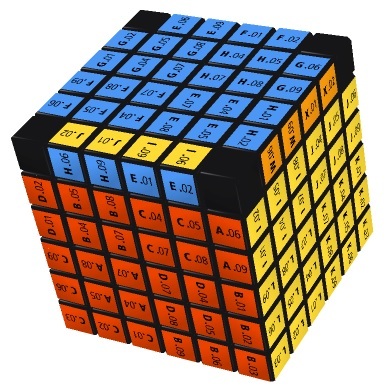 Next you rotate the whole Supercube so that the orange face now faces backward. You then substitute 2 into the variable x and use formula (5). This will flip and swap the "N.01-X.09" and "M.09-U.01" edge pieces and thus yield the desired result. Note that by using either formula (3) or (5) on each non-core inner layer in the right (or left) half of the Supercube, the net effect is that the top center (as well as other centers) will not get screwed up (try and see). Here "place correctly" means placing a piece at the correct position, "orient correctly" means making the facelets of a piece face the correct directions so that there is no twisting (of a corner piece) and no flipping (of an edge piece), whereas "solve" means both "place correctly" and "orient correctly". For most of the sub-steps listed above, there is no difference between the methods of solving odd-order and even-order Supercubes. The only exceptions are Sub-steps 4 and 6, which I will discuss below. 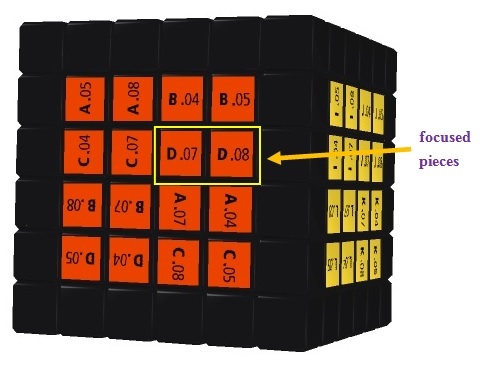 The above figure shows a 6th-order Supercube. 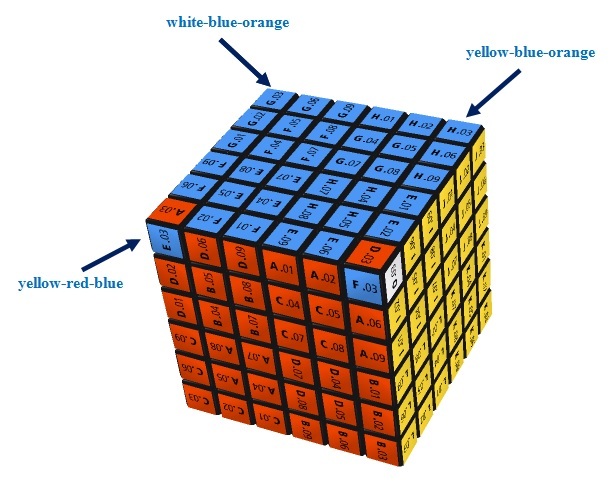 Among the 4 edges on the top face of this Supercube, only the "yellow-blue" edge is oriented incorrectly with its blue facelet facing forward instead of upward (note that although the "orange-blue" edge is placed at the incorrect position, it is oriented correctly with its blue facelet facing upward). In this case, if you keep on using the formula FRUR−1U−1F−1, you can never finish this sub-step. What you need to do is rotate the whole Supercube so that the incorrect edge is facing forward and then apply the One Side Flipping Formula (5) to flip the incorrect edge (since there are two inner layers in the right half of this 6th-order Supercube, you need to apply (5) to both of these inner layers). After applying (5), you finish this sub-step. In case there is only 1 top edge oriented correctly before doing this sub-step, you can also apply (5). The result of this move is a Supercube with 0 or 2 top edges oriented correctly. You can then use the formula FRUR−1U−1F−1 to finish this sub-step. 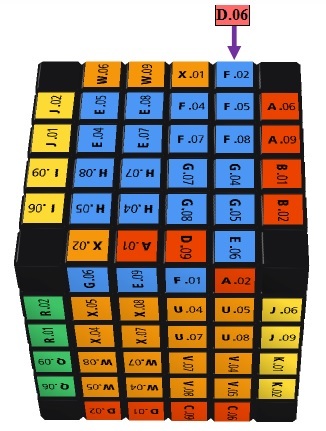 The above figure shows a 6th-order Supercube. Among the 4 corner pieces on the top face of this Supercube, exactly two (i.e. the "yellow-blue-orange" and "white-blue-orange" corner pieces) are placed correctly and they lie on a horizontal line. In this case, if you keep on using the formula URU−1L−1UR−1U−1L, you can never finish this sub-step. What you need to do is rotate the whole Supercube so that the two correct corner pieces are at the "front-right-top" and "back-right-top" corners. You then apply the Two Side Swapping Formula (4) and Two Side Flipping Formula (6) successively. By so doing, you will screw up the 4 top edges that have been placed correctly in Sub-step 5. So you need to do Sub-step 5 again. After this, you will find that there is only 1 top corner placed correctly. You can then use the formula URU−1L−1UR−1U−1L to finish this sub-step. In case exactly 2 top corners are placed correctly and they lie on a diagonal, you can rotate the whole Supercube so that one of the correct corner pieces is at the "front-right-top" corner. After applying URU−1L−1UR−1U−1L once, the result is a Supercube with exactly 2 top corners placed correctly and lying on a vertical / horizontal line. You may then proceed as described above. In case no top corners are placed correctly, just apply URU−1L−1UR−1U−1L once or twice. The result is a Supercube with exactly 1 or 2 top corners placed correctly. You may then proceed as described above.